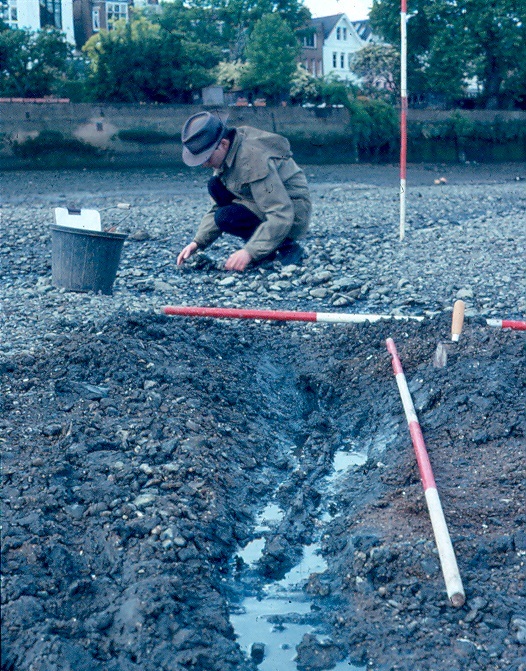 Remains of three fish traps were identified on the Thames foreshore by Wandsworth Historical Society during the 1970s, two at Barn Elms and one at Putney. 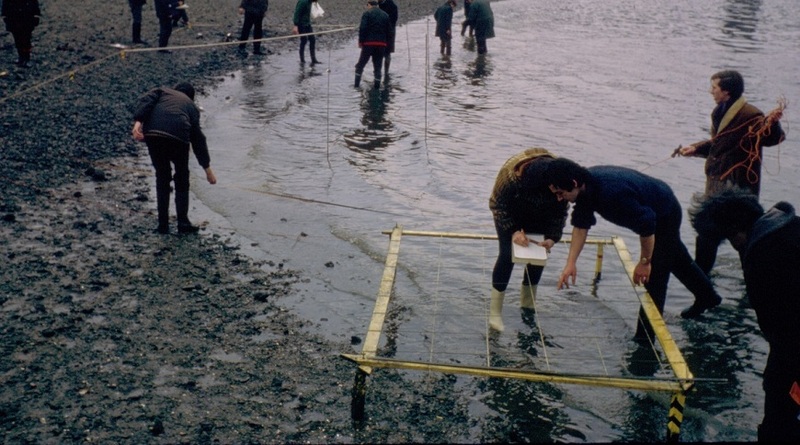 Wandsworth Historical Society began recording the Putney fish trap in February 1971, subsequently adding to these records whenever feasible, particularly when river levels were low in 1976 and during the mid-1990s droughts. The fish trap lies about 140 m downstream of Putney Railway Bridge at around 0 m OD, present day sea level. Most it is only accessible or visible at very low tides and parts even further out into the river only when the tide is exceptionally low. We may have a section of a V-shaped fish trap/fish weir pointing downstream or part of a trap angled across the river or one of its old channels. So far, no sign of it has been found on the Fulham side. The structure consists of two apparently parallel rows of timber posts, about 1 m apart, aligned east-west. The first row is at least 32 m long, while the second has only been traced sporadically for about 11 m. More than forty-five posts in the first row and at least five in the second have been mapped so far, with at least thirty of these recorded in greater detail. The posts are set into the grey peaty silts or sandy shelly deposits and rise just a few centimetres above the foreshore surface. Their visible diameters range from 3-14 cm, though most are around 6-9 cm. A section of wattling forming part of the fish trap lies preserved underneath the gravel bank on the shore side. Samples taken from two posts, one oak and the other elm, gave radiocarbon dates of AD 410-620 and 420-640 respectively. These 5th- to 7th-century dates span the Late Roman to Early Medieval period, a similar date range to that of a V-shaped fish trap/weir from Shepperton. Another timber structure, about 20-30 m downstream at the mouth of the Putney Gutter on the parish boundary, has much larger posts - small tree trunks with the bark still attached. It does not seem to relate to the fish trap. 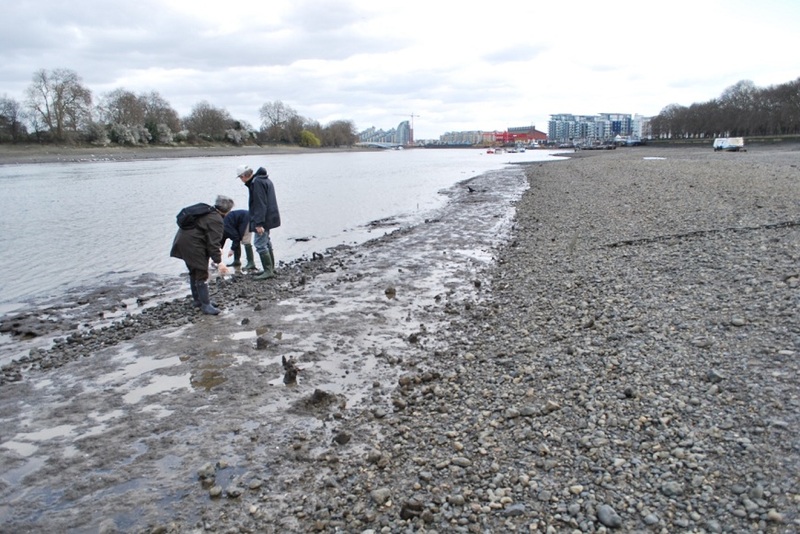 Although there are still no finds that can be said to belong to the fish trap, this sector of the Putney-Wandsworth foreshore has a general spread of Late Roman finds, some very late in date. Early medieval Saxon finds, though, are very scarce, but do include a couple of fragments of pottery probably dating AD 700-850 and two plain seaxes (iron knives). Only a short way upstream to the west of the High Street is Roman Putney, a settlement with very Late Roman finds including some types of pottery and coins current in the early 5th century. Early medieval Putney is likely to be in the area around the present parish church, again a short way upstream. 1) WHS Site code PFS IV feature , the fish trap, and feature , the wattle associated with it at its south end; WHS archive; Greenwood P. 2008 'Putney (Surrey)' in R. Cowie and L. Blackmore (eds) Early and Middle Saxon rural settlement in the London region, Museum of London Monograph 41:116-118. Thames Discovery Programme area code FWW-04. 2) Calibrated dates at 95% confidence (lab nos GU-5719 and GU-5720) , Cowie and Blackmore 2008: 212-213. 3) Bird D.G. 1999 'Possible late Roman or early Saxon fish weirs at Ferry Lane, Shepperton' Surrey Archaeological Collections 86:103-123. Calibrated radiocarbon dates for this trap are AD 410-650 at 68% confidence or AD 350-690 at 95% confidence and are generally supported by the pottery and tile finds. 4) WHS site code PFS IV feature . 5) One published in Farrant N. 1971 'Two Weapons from the Thames' Transactions London & Middlesex Archaeological Society 24: 157-158. 6) Farrant N. 1972 'The Romano-British Settlement at Putney' London Archaeologist 1.16: 368-371; WHS archaeological data. Plan of the Putney fish trap (2008). WHS planning the Putney fish trap early in 1971, looking towards Putney. Investigating and recording the section of wattling alongside the fish trap in summer 1995. WHS monitoring the Putney fish trap in spring 2009, looking towards Wandsworth.